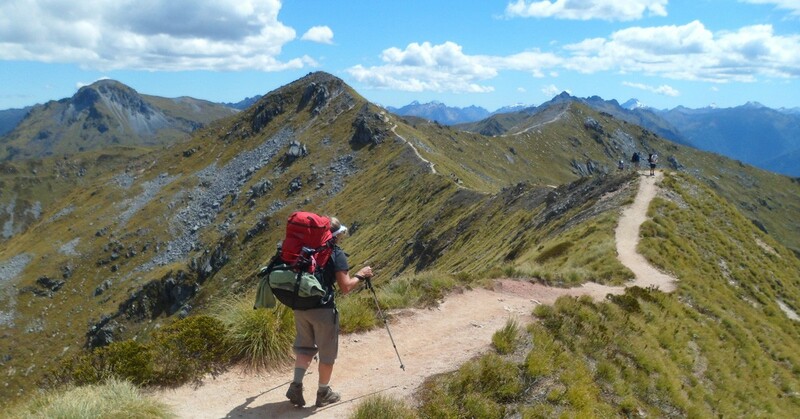 New Zealand’s South Island is famous for its Great Walks and multi-day hikes. It is justifiably elegant and an icon, but don’t break out the sleeping bag just yet. Much of the same wilderness can be explored by day hikes, hence less effort, less gear and more fun. I honestly don’t think there is a better way to stretch your legs and get fresh air after spending long hours in flights to get to these remote islands that going on a hike. You may get thirsty, hungry, and tired, but once you’re done with the hike and you see the photos, you will know it was all worth it. My best recommendation is the Kepler Track which cuts through the Fiordland National Park and ends in the South of the Island. 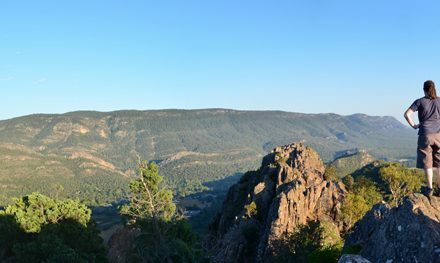 It is a great option when outside the Great Walks seasons and the views are spectacular to say the least. Unlike many trails, the Kepler Track was opened to offer pleasure rather than necessity. 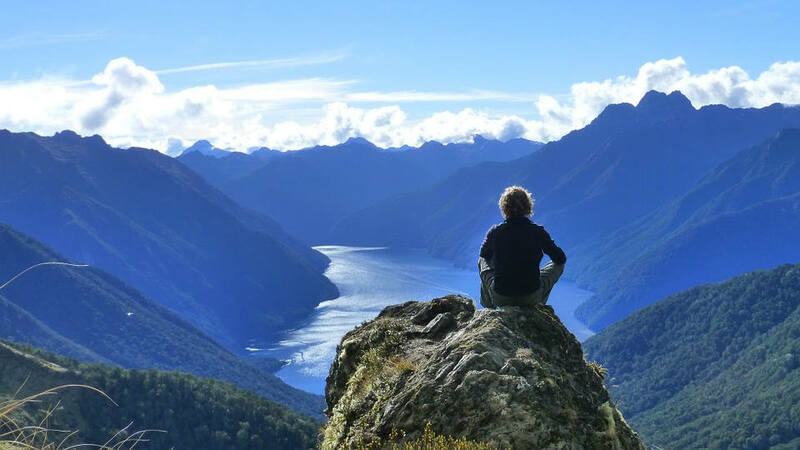 It was opened in 1988 to show the best features of Fiordland National Park including cascading waterfalls, moss-draped beech forest, huge mountain ranges, limestone formations, luxuriant river flats, prolific bird life and more. The construction of the track makes walking easy as steep areas have stairs; boardwalks cover boggy areas while most streams are bridged. Walking this trail, you will see everything that’s beautiful in this far corner of the world. Start your hike at Lake Te Anau Control Gates. 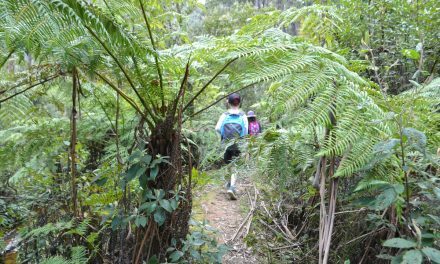 The trail will take you along the southern shores of the lake and through fern forests. You will reach Broad Bay after about an hour, where you can have the first rest. A long ascent starts after one and a half hours and ends at Luxmore Hut where there is an altitude difference of 883 meters. The total distance trekked up to this point is 13.8 kilometres. From the Luxmore Hut, you can see the lake down below. There are caves nearby that can be explored, but only if you’re experienced and equipped with headlights. The views down the valley from the hut are incredible but since it’s a new day, you have to get moving. Most of today’s trek will be a ridge hike and will take you all the way to the next valley. The first 1-2 hours are all about climbing until you get to the Mount Luxmore. The panoramic views from here will not disappoint. The mountain can be climbed easily and the next 2 hours from here will take you across ridges on a path partially covered in snow. The Hanging Valley Shelter is a great spot to stop for lunch. Be sure to keep an eye on your food as keas have made it somewhat a home. Shortly after this, the descent to Iris Burn valley starts. You can say goodbye to those views as it’s just bush from here. You will reach the Iris Burn Hut after two hours. This is a good place to spend the night. The hut is lovely, but perhaps it’s worth considering a camping experience in a hammock tent. There’s plenty of trees nearby to hang your tent. The Iris Burn Falls are just nearby and if you are lucky, you may encounter glowworms on the way. This part of the hike will be easy, which is good considering you’ve had a hectic two days. The trail will take you through a lush forest with streams all around. The track isn’t too difficult so you can manage a higher pace to get to Moturai Hut in less than three hours. The hut is located along the shores of Lake Manaouri, an area that offers stunning views. This is a good place to relax and spend the night. Today’s hike is only a matter of a few hours. Along the way, you will come across the Amoeboid Mera, a bog that was used as the Dead Marshes during the filming of Lord of the Rings. If you are too tired, which is understandable after four days of hiking, you can catch one of the hiker’s buses, but you’ve come this far, so plough on and pat yourself on the back for a job well done. As with any outdoor experience, the decisions you make as well as safety are your responsibility. Ensure that you check the conditions of the trail as well as weather forecast at the DOC Visitor Center. Pack the right gear, enough food and a first aid kit. A personal locator beacon or mountain radio is highly recommended if hiking outside the Great Walks season. Your mobile phone won’t be useful as there is little to no network coverage. The tracks are sometimes closed for safety reasons so check with local guides. Access: The Kepler circular track starts and ends at the Kepler Track car park. 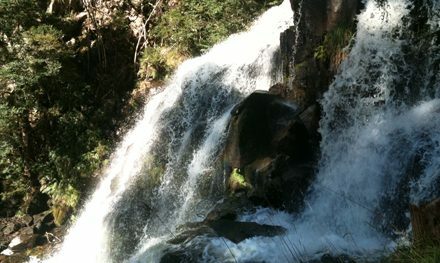 Sights: Ridge-top alpine views, wetlands, lakes, rivers, forests, waterfalls. Hazards: While hiking you are at risk of hypothermia, sunburn, high winds, slips, flooding, fires, and getting lost. Map: There are three brochures you get each with a map. They include “Kepler Track brochure” (includes map and profile), “Kepler Track walking guide” (pick one up when you collect your tickets at the Fiordland National Park Visitor Centre), and “Kepler Track winter tramping” (includes map of avalanche paths). Conditions: High standard tracks that are well formed and easy to follow. Usually covered in dirt, rock or gravel and tends to get slippery in wet weather. The trail is quite wide depending on the landscape – flat areas fit two individuals walking side by side. Other hilly places make the trail steep offering better view. The majority of rivers and waterways on this trail have sturdy bridges. However, be on the alert for wet weather rivers that rise quickly and flood of the tracks. Booking and fees: You can book a walk independently or book with a tour provider. For more on fees on campsites and huts, visit the Department of conservation site. From here you will get to know whether there are discounts on offer and how to make payments. Transportation: You can access the Kepler Track either by road or by fifty-minute’ walk from the Fiordland National Park Visitor Centre. Another option might be the Rainbow Beach entry point that is a ten minutes’ drive from Te Anau. During the great walk seasons, shuttle buses offer transportation to the sites. Accommodation: The Department of Conservation (DOC) provides two campsites and three huts along the track. All campsites and huts require prior booking from late October to late April. All the accommodation facilities have plenty of running water, solar power, seating and cooking amenities during summer months. Preparations required: Ensure you carry all your camping essential gear. Remember to pack extra warm clothing as it tends to get windy up there. Bring food that is lightweight and fast to cook. Further info: As with any outdoor experience, the decisions you make as well as safety are your responsibility. It’s best to visit during the Great Walks season as there are few facilities and potential hazards during offseason. Ensure that you check the conditions of the trail as well as weather forecast at the DOC Visitor Center. A personal locator beacon or mountain radio is highly recommended if hiking outside the Great Walks season. There is little to no mobile network coverage. Have you visited Kepler Track? Got it on your bucket list? If you have any stories, updates or corrections, please let us know by commenting below. Joe runs Nature Rated. He love's spending time in the outdoors. Whenever daily life gets him down he heads to the nearest lake or river with his kayak and my camera and spends time recharging his batteries. He hopes you'll love his no fluff, to the point reviews, and that they'll help you choose the right gear for your next adventure. It is the best walk I’ve done in NZ butstill to do the Milford and Routeburn. 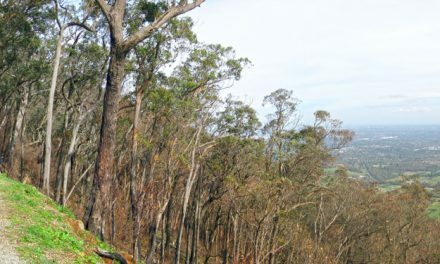 If the day along teh ridge had poor weather it would reduce the enjoyment considerably. The first two photos are not the Kepler. Also it would be extremely risky to do the walk outside the tramping season, except for someone who has experience of alpine conditions. The weather along the ridge could be extreme. I’d love to do all of them, Ken! Unfortunately haven’t done any hiking in NZ apart from a short glacier hike at San Josef. As for the photos, I’ve been in touch with Joe about this and he says he may have got the landscape photo confused, so I’ve removed that one. He’s sure that the waterfall was on the Kepler, though. Incidentally, he’s walking the Kepler again as we speak, so he’s going to double-check. Thanks for the heads up. Just heard back from Joe and you are also correct about Taranaki. Thanks for picking up on that! He’s going to send me some more photos when he’s back home.